Sunday, September 12, 2010 was our personal Emancipation Day. That was the day that, all our boat tasks completed and everything installed, we filled our fuel tank and jerry jugs and sailed away en route to Darwin! We were the last rally boat left in Mackay. We were afraid we would never leave! Caution- laundry list of repairs to follow! For a boat that was in quite good shape, we certainly had a lot done- and boosted the Australian economy! We knew we had to get fibreglass work done on the hull as we had been taking i=on salt water since the Galapagos. This related to the crack in the hull from our close encounter with a rock off of La Blanquilla, Venezuela four years ago. It had been repaired once in Trinidad and again in Curacao. However, we were getting rather worried when the automatic bilge pump kept sounding the alarm more and more frequently as we travelled. Hopefully this third repair is the charm. The workers did a very good job. However, we are less than thrilled with the bottom-painting job they did. Everything had to be repainted with non-tin-based paint (illegal in Australia). The finished result looked good until we examined it three days after we left. The workers did not remove some loose paint,and retreat the area; they merely covered it over and, of course, the slings from the TraveLift scraped the whole area bare! We will have to redo it in Phuket. Our new VHF radio was awaiting us from Canada (cheaper, even with FEDEX charges than buying it in Australia). Our old radio worked fine, but the cord for the cockpit remote mike kept degrading within a month of installation. Extras are always good. Our new wind generator had arrived from Trinidad and Dave installed it with no problems. The rigging was checked and we had to replace a chain plate at the top of mast (sent from Europe, of course). This little item connects the stays to the mast- rather essential. We had decided to splurge on an AIS transceiver so that we could be seen by freighters, especially through the narrow passages along the Great Barrier Reef. It is a wonderful 'Magic Box"! It was definitely worth the expense. However, after installation it kept sounding an alarm that said we had lost the satellites. After much kerfuffle, we discovered it was the sea wall behind us that caused the loss of a low satellite's signal. It has functioned well ever since. Dave worked on the malfunctioning heads and now both toilets are working well. (Always a positive sign!) A plumber came in to install new faucets in the forward head and in the galley. However, I am so well trained now to use the foot pump, I keep forgetting we can use a tap normally! Our longest delay was for our inverter/charger, which was working perfectly until, in the scramble to get ANGEL into our berth at the marina, someone went to plug an extension cord into our step-down transformer (to change 240 volt current into 110 volts) and forgot to plug the cord into the transformer. Plugging 240 volts directly into the boat doesn't work! The inverter/charger took a trip to Brisbane! One final purchase before leaving........ 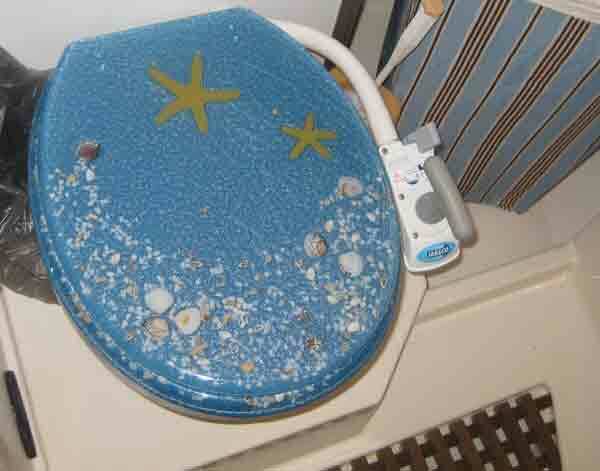 The toilet seat in the aft heads was so worn through at the plastic hinges it would fall off after every use. We bought a more secure one with metal hinges- and seashells imbedded in acrylic1 Yes, it is tacky, but it makes you smile every time you use the heads! Tacky, but fun- our new loo seat! Now we were back playing "catch-up" again. 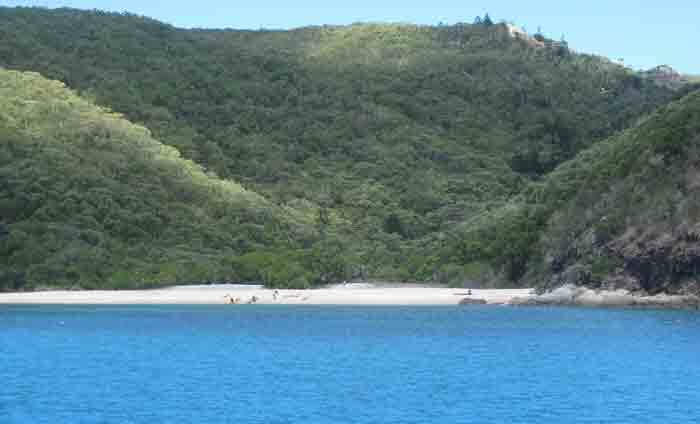 We sailed to Brampton Island in the southern Whitsundays. We had to stop there because I was born in Brampton, Ontario and it was, therefore an appropriate stopover. It was also only 25 nm away. Unfortunately, we didn't go ashore there as there was not enough time. Next stop was Thomas Island with its inviting trail around the island to the summit. Fai Tira spotted a koala and a wombat here; however, we were rushing and didn't go ashore (again). It's a good thing we had learned to sail in the Whitsundays. This is a cruising paradise, probably as popular as the British Virgin Islands, but much roomier and more natural. Most of the area is national marine park land and the habitats are being carefully preserved. We sailed past the fabulous endless powder soft white sand beach of Whitsunday Island-Whitehaven Beach- enviously. However, we DID stop overnight in Maureen's Cove, Hook Island. Here there was wonderful snorkelling and we made the most of it. Beyond this point, there would be little or no swimming because of estuarine crocodiles. A party of kayakers made camp on the beach and enjoed the cove with us. We were awakened by a repeated loud thumping in the morning. With no wind, the mooring buoy was thumping against the hull as the tide changed. 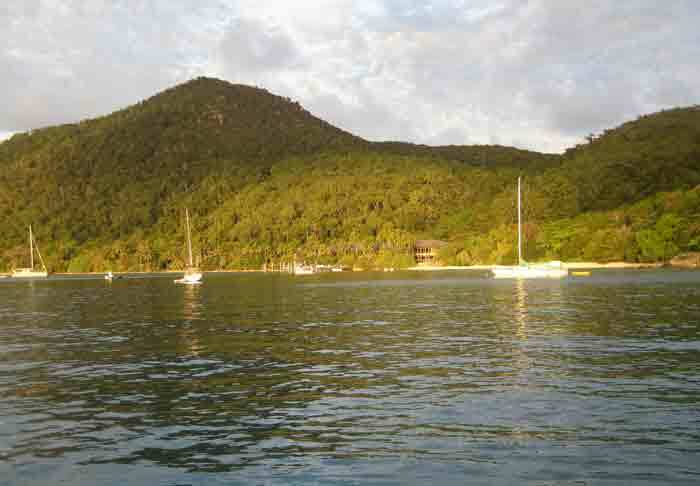 We hastily extricated ourselves and set off for Fitzroy Island three days north. Again, this island was extremely inviting- although VERY busy, with many yachts at anchor and a busy resort ashore. Simone on LAROOBAA says her two little ones, Hugo and Juliette, loved it here. All that beach was perfect for a three and four year old! The next morning we braved the extremely shallow waters of Yorkey's Knob to fuel up at the marina there and set out to share the crowded passageways with freighters (armed with the new AIS transceiver, of course) en route to one of our favourite spots- Lizard Island.